Essex and Williams 82 cultivars respond differently to UV exposure. Ultraviolet-exposed Williams 82 exhibited greater gs after the initial exposure response of reduced gs compared to the control plants that did not correspond with changes in E. Essex initially showed an increase in gs and E with UV exposure which then decreased after one day of UV exposure, or 8 kJ m-2 -12 kJ m-2 UV-Bbe exposure. The exposure of Essex and Williams to UV radiation showed no affect on photosynthesis (A or PS II efficiency), consistent with many other studies. Plant tolerance to UV-B exposure involves many different strategies including radiation avoidance, changes in leaf structure, enhanced production of UV-B absorbing pigments, enhanced production of photosynthetic pigments, and dimer repair (Caldwell et al., 1983; Day et al., 1992; Vogelmann, 1993). The 2004 greenhouse and field experiments showed that the production of secondary compounds in the presence of UV radiation differed between Essex and Williams 82 cultivars. Williams 82 showed no significant increase in UV-B absorbing compounds after 18 hours of UV-B radiation exposure. Essex, on the other hand, accumulated UV-B absorbing compounds while UV-B exposed Williams accumulated chlorophyll a and carotenoids compared to control plants. The lack of UV exposure effects on pigments in some plants was related to higher UV-B screening compounds (Day et al., 1992; Sullivan et al., 2000). This may explain why UV-B did not significantly alter photosynthetic pigment concentrations in Essex. The production of secondary compounds depends on the amount of photosynthetically fixed carbon partitioned to growth or defense (Herms and Mattson, 1992). Photosynthetic rates and CPPSn of both Essex and Williams 82 were not significantly affected by the UV exposures. Initially it appears that carbon fixed by Essex was preferentially directed towards the production of UV-B absorbing compounds, while that of Williams 82 was preferentially directed to compounds enhancing photosynthesis. Therefore, it appears that Williams 82 has significant UV tolerance mechanisms other than UV-B absorbing pigments for UV-B protection. The results of the present work have suggested that Essex and Williams 82 have different mechanisms to control injury and increase tolerance that appear to be activated after brief exposures to UV-B. In Essex, chlorophyll concentrations were unaffected by UV exposure in both the short-term greenhouse study and the longer term field study, while in Williams 82, chlorophyll concentrations increased with UV exposure in the greenhouse. Chlorophyll concentrations are often highly correlated with photosynthetic capacity (Dillenburg et al., 1995). Since CPPSII was also not affected by the UV exposure, the observed increase in chlorophyll a concentrations in Williams 82 (Table 16.2) was not readily explicable. The lack of UV exposure effects on the photosynthetic rate of Essex and Williams 82 plants, even though other physiological responses are affected, supports the growing evidence that biomass reductions and yield losses are associated with changes in plant morphology more than function (Day, 2001; Kakani et al., 2003). Additionally, alterations in gene expression before there is any UV-B induced injury (RNA levels for chloroplast proteins and other biochemical composition) cannot be discounted. Comparisons between greenhouse and field studies are always fraught with complications. As found in this study for gs and E, differences in plant responses to UV exposure commonly found in greenhouse studies are not found in field studies. This may be a result of the influence of water stress, temperatures, plant competition, available PPFD, and a host of other environmental conditions. Of interest is the evidence for similar relationships between Essex and Williams of UVB-absorbing compounds in early vegetative leaf stages. This suggests that the effects of UV exposure on these cultivars may at least be somewhat similar between greenhouse and field studies. Although efforts were made to minimize the differences in PPFD between UV-exposed and control plants, the disparity between PAR exposures may influence the results discussed. Furthermore, the ratio of PPFD to UV-A and UV-B irradiance varied to some degree. 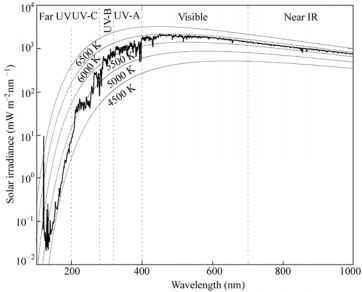 Since plants are known to have complex responses to spectral irradiance, the variation in these ratios may have exclusively masked UV effects on plant physiology. The variability in physiological measurements both in the greenhouse and in the field studies limited the ability to differentiate effects due to UV exposure, PPFD, and these irradiance ratios between PAR, UV-A and UV-B radiation. Further work should be conducted where the UV-exposed and the control plants have more similar and higher PAR exposures, and similar irradiance ratios to assess what the UV-protective mechanisms initialized within the first day of exposure are, and how they are regulated. In addition, further understanding is needed to determine how decreases in daily exposures due to cloud cover vary the cumulative longer-term plant response.